A new year begins. Whether we write goals for the year, make resolutions, or set intentions, most of us pause to anticipate the new year and imagine how we’d like it be. That is the instinct of hope in us. It is the awareness of our capacity to create change. What we sometimes don’t factor into making change – and what often brings failure and retreat – is the ingredient of . 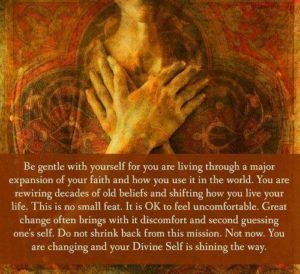 . .
Change – even welcome change – always generates some degree of discomfort; that knowing that we are moving out of what has become familiar into what is potentially unknown. Our deep, unconscious survival instincts kick in. We crave certainty. We believe safety is in knowing . . . for certain. Yet much of life is not certain because most everything is always changing. And if we deliberately, intentionally, consciously set our minds and hearts on creating change, we are inevitably going to collide with . . . Protect yourself from being de-railed by discomfort. So how do we manage the discomfort while change is taking place? 1. Identify how the discomfort is expressing itself physically, emotionally, mentally. Notice emotional shifts such as irritability, edginess, snarkiness, impatience, excitability. Observe your sleeping patterns. Note changes in eating, drinking, or medication intake. Be aware of breathing habits, bodily pain, headaches, muscular tightness, injuries. Any of these can be indicators that you are in a state of discomfort related to change in your life – even if the change is welcome. Accepting that promotion might bring some great bennies, but it will also bring added responsibility. It’s natural to feel both excited and uncomfortable. 2. Acknowledge what you will be losing in this change. Even if you’re eager to “get out of Dodge”, there will be loss(es) in the change. Even when saying “good riddin’s” to an unwanted relationship, you’ll be saying good-bye to what might have been. 3. Exercise proactive self care. Do what you need to do to care and support yourself in the discomfort. Make tonic, not toxic choices. Eat well. Exercise gently. Breathe deeply. Sleep enough. Laugh often. 4. Focus on what is most important to you in this change – on the gains. Focus on what compelled you to move toward change. The more connected to love, the easier the transition will be. You made a choice to change your eating and activity patterns because you desire to be healthy. Allow your mind, fueled by your heart, connected to your soul to support your commitment. 5. Get support. Encouragement and accountability are essential. Even The Lone Ranger had Tonto. Don’t struggle in isolation; eagerly receive the resources that are there for you. If you want to expand your business, find an accountability partner. If you want to get healthier, hire a trainer. If you want to move through the grief, join a support group. If you want to purge your basement, contract an organizational coach. Whatever you need, avoid making excuses. Don’t hesitate to keep seeking until you find the help you need. Do not relinquish hope. Trust in your own tenacity. 5. Be open to the adventure of the unexpected. The constancy of change brings infinite opportunities. Stagnating is contrary to our nature. Trust that all that is good in the universe has conspired to support your well-being, as you open yourself to change. If your conducted a job search a certain way last year, consider the possibilities that there are opportunities yet to be discovered this year. Stay open. Stay curious. Stay hopeful. You can navigate the discomfort knowing that, like the trapeze artist that lets go on one ring to grasp a new ring, that moment of suspension in between requires trusting the discomfort of anticipation. Trusting the discomfort of anticipation creates new opportunities for happiness, contentment, success, and peace. You want the fulfillment of the desires of your heart? Trust yourself in the discomfort – you can and will make it through.